The Glam & Gore Picture Show, presented by Dead for Filth Michael Varrati, focuses on bringing a queer twist to classic horror movies. Presented for free every Saturday by queer streaming site REVRY, The Glam & Gore Picture Show digs deeper into films such as Nosferatu and The Last Man On Earth. Through a mix of wit and inspiration from horror greats like Elvira, Varrati brings a wonderfully queer twist that is sure to capture and delight all viewers. 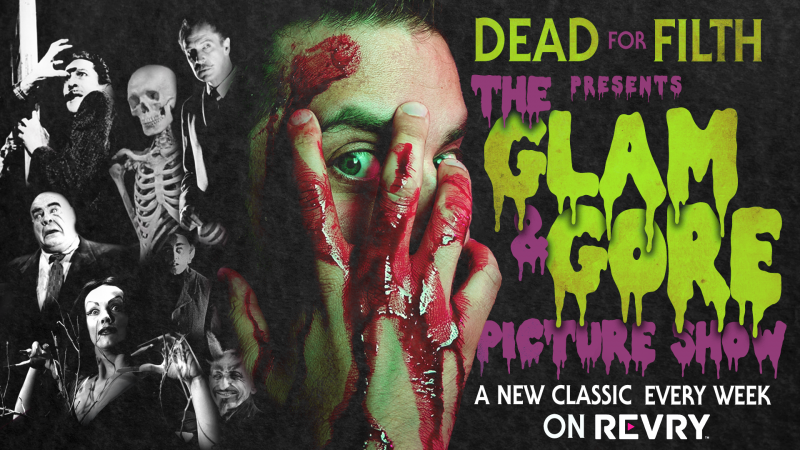 The Glam & Gore Picture Show hopes to bring horror classics to a younger generation as well as those newly into queer horror. Queer horror has been around for many years, including being pervasive in many of the classics. Varrati is no newcomer to the screen or horror either. Not only has Varrati been the host for the queer horror podcast Dead For Filth, but he has also worked as a screenwriter, columnist, and actor. His name can be found in the credits for such movies as Tales of Poe, Flesh for the Inferno, and The Sins of Dracula. To top his amazing resume off, Varrati is also the host of the yearly San Diego Comic Con panel “Queer Fear”. If there is a person suited for this job, Varrati is the guy. At the time of this writing, two episodes are currently out to watch for free on REVRY, with three more on the way. Dead For Filth can also be found on REVRY, as well as iTunes. The final episode of The Glam & Gore Picture Show will drop on Halloween, so be sure to catch-up while there is still time!